12:42 p.m. - SEVERE THUNDERSTORM WARNING issued for northern Burlington, Camden, Gloucester, Mercer, central Monmouth, southern Middlesex, NW Ocean and NW Salem counties until 1:30 p.m. for a line of thunderstorms moving east at 50 mph with 60 mph wind gusts that could cause damage to trees and power lines. --Dense fog has formed across much of New Jersey. As of this writing, visibility is no better than 3 miles (north/south), and as low as a quarter-mile through the middle of NJ. 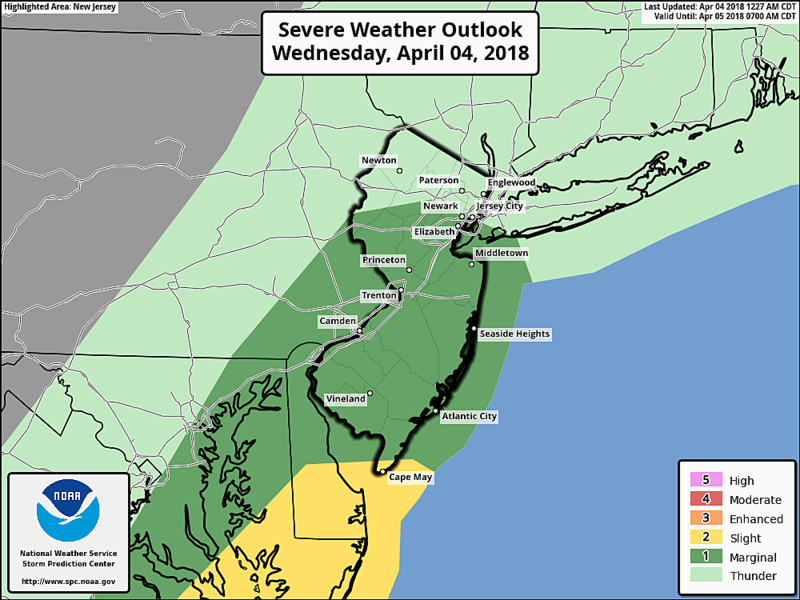 The fog situation will improve after sunrise (6:38 a.m.) and done completely by about 10 a.m.
--A line of showers and thunderstorms will charge from west to east across New Jersey around midday through early afternoon, say 11 a.m. to 3 p.m. For part of the state (especially north and west), that rain might be very brief and unimpressive. 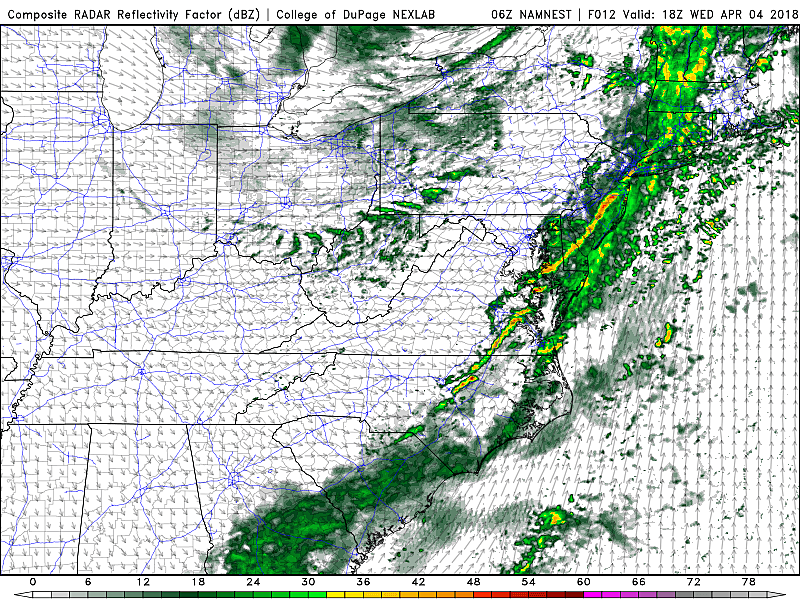 However, as marginal instability builds into New Jersey along with the warmth and humidity, some of those storms could reach strong (40 mph) or severe (60 mph) limits. Best chance for stronger storms will be to the south and east — around Monmouth, Ocean, Atlantic, and Cape May counties. --50 mph wind gusts will kick up Wednesday, peaking in the afternoon hours. (Sustained winds 20 to 30 mph, out of the west-northwest.) A High Wind Warning has been issued for northwestern Burlington, Camden, Gloucester, Hunterdon, Mercer, Morris, Somerset, Sussex, and Warren counties. A Wind Advisory has been posted for the rest of the state. --Temperatures will plummet thanks to that fierce west-northwest wind. Thermometers will fall into the 40s by sunset Wednesday, bottoming out near 30 degrees overnight. A freeze is likely for much of New Jersey. Furthermore, as the brisk wind continues overnight, the wind chill ("feels like" temperature) will easily dip into the 20s by Thursday morning. We get exactly one quiet weather day this week to catch our breath — Thursday. As I mentioned, the morning will be unseasonably cold. And we'll remain breezy and cool, with high temperatures limited to the upper 40s to around 50 degrees (almost 10 degrees below normal for early April). The abundant sunshine will be welcome. Another storm system arrives early Friday morning, impacting New Jersey from about 2 a.m. to Noon. This is a weak one, so precipitation will be on the light side. South of Interstate 195, the temperature profile supports mostly rain with just a few snowflakes mixed in. 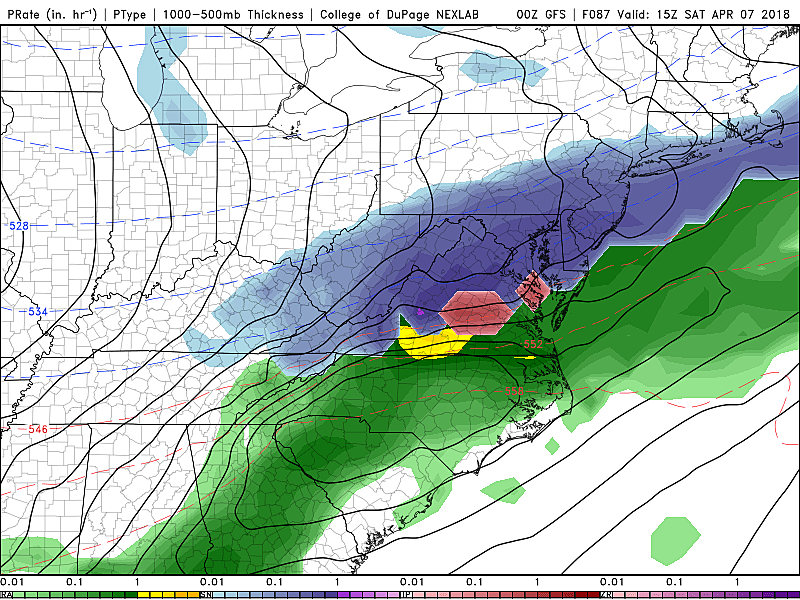 Models currently keep the area between I-195 and I-78 warm enough for mostly rain as well, but that could easily flip to the other side of the freezing point — I wouldn't rule out a period of more wintry-ish weather at some point. North of I-78, we'll have to watch for some snow accumulation. My current thinking is on the order of an inch or two. As this system exits by Friday afternoon, skies will begin to clear. That will allow high temperatures to reach the upper 50s to lower 60s (wherever snow does not accumulate). Hard to enjoy the relative warmth, however, as the gusty wind returns to the forecast too (40+ mph). For a few days, we've been watching a "close call" storm system passing just south of New Jersey for the first half of the forecast. Well, the forecast has trended farther north, closer to New Jersey. And, since we'll be on the cold side of the storm, accumulating snow has become more likely. Best idea of timing would dump the steadiest snow over New Jersey on Saturday morning. 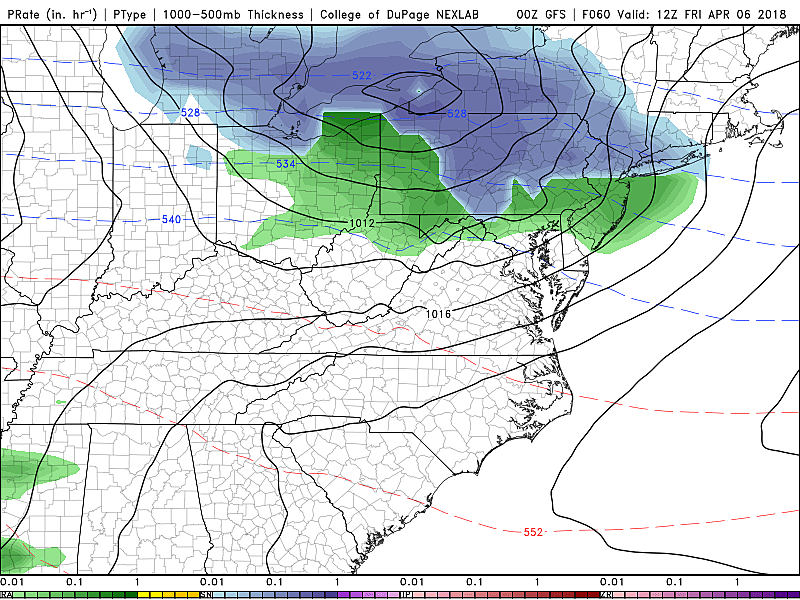 (The Euro model notably paints the snowfall a bit later, closer to Saturday night.) If I had to draw a snow map right now, I'd probably put a swath of 3-6" inches of accumulation across a stripe of southern New Jersey, tapering to 1-2" in North Jersey. The latest Euro pushes out an even snowier solution, with upwards of 9-10" of snow for inland South Jersey. Yikes! I caution that this forecast remains low confidence and highly volatile, with first flakes still almost 72 hours away. We'll have a better sense of the potential storm's overall timing and impacts on Thursday morning, with more specific snow totals coming into focus by Friday morning. The active weather continues for next week, with (dare I say) a nor'easter-ish storm system modeled in the Monday-Tuesday time frame. I'm not even going to take a guess at potential precipitation types and accumulations this far out. Even if the storm is a dud or a total miss, we may have to consider some surf and surge issues through the first half of next week too. Looking for Spring? I'm still thinking the beginning of next next week, around April 15, will mark the beginning of a sustained warmup through the second half of the month. Hold your breath and cross your fingers — 70s will be back soon!